From the very beginning of the mass working-class movement in Russia, i.e., approximately for the past ten years, profound differences have existed among Social-Democrats on questions of tactics. As we know, it was differences of this kind that gave rise, in the late nineties, to the trend of Economism, which led to the split into an opportunist (Rabocheye Dyelo) wing and into a revolutionary (old-Iskra) wing of the Party. Russian Social-Democratic opportunism, however, differed from that of Western Europe in certain peculiar features. It strikingly reflected the point of view, or rather the absence of any independent point of view, of the intellectualist wing of the Party, which was carried away both by the current catchwords of Bernsteinism and by the forms and immediate results of the pure-and-simple labour movement. This infatuation led to wholesale treachery on the part of the legal Marxists, who went over to liberalism, and to the creation by Social-Democrats of the famous “tactics-as-process” theory, which firmly attached to our opportunists the label of “tail-enders”. They trailed helplessly behind events, plunged from one extreme to another, and in all cases reduced the scope of activity of the revolutionary proletariat and its faith in its own strength, all of which was usually done on the pretext of raising the independent activity of the proletariat. Strange, but true. No one talked so much about the independent activity of the workers, and no one did so much by his propaganda to narrow, curtail, and diminish that activity as did the Rabocheye Dyelo-ists. The two steps back which the new Iskra took towards Rabocheye Dyelo revived this attitude. Once again the columns of Iskra pour forth the preachings of tail-ism under cover of the same nauseating vows: Verily, 0 Lord, I do profess and believe in the independent activity of the proletariat. It was in the name of the independent activity of the proletariat that Axelrod, Martynov, Martov, and Lieber (the Bundist) defended at the Congress the right of professors and students to become members of the Party without joining any Party organisation. It was in the name of the in dependent activity of the proletariat that the “organisation as-process” theory was invented, a theory that justified disorganisation and glorified the anarchism of the intellectuals. 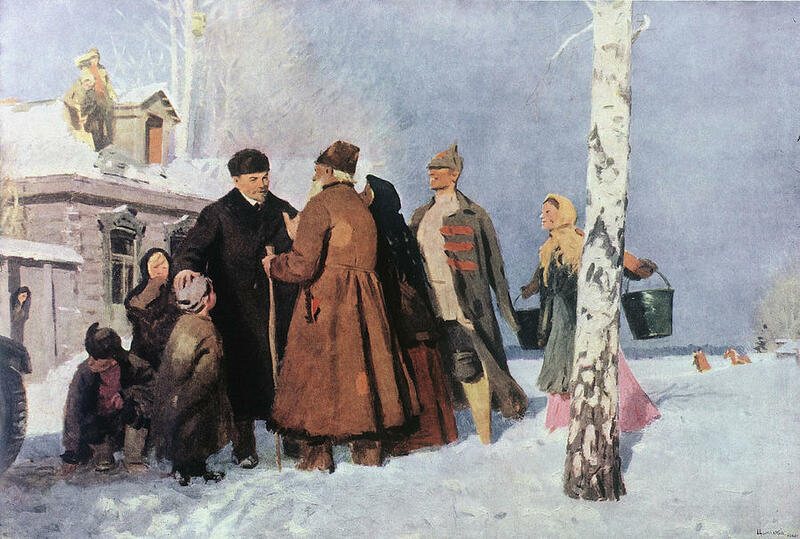 It was in the name of the independent activity of the proletariat that the no less famous “higher-type-of-demonstration” theory was invented, in the form of an agreement between a workers’ delegation, which had been passed through the sieve of a three-stage system of elections, and the Zemstvo men for a peaceful demonstration that was to create no panic fear. It was in the name of the independent activity of the proletariat that the idea of the armed uprising was perverted and vulgarised, debased and confused. In view of its vast practical importance, we should like to draw the reader’s attention to this question. The development of the working-class movement played a cruel joke on the wise men of the new Iskra. They circulated a letter in Russia, which, in the name of “the process of the systematic development of the class-consciousness and independent activity of the proletariat”, recommended, as a higher type of demonstration, “that the workers’ petitions be posted to the homes of the municipal councillors and a considerable number of copies scattered in the Zemstvo Assembly Hall”; they sent a second letter to Russia, conveying the most sensational discovery that at the present “historical moment the political stage is fully occupied [!] by the conflict between the organised bourgeoisie and the bureaucracy” and that “every [mark well!] revolutionary movement of the lower strata has only one [!] objective meaning, to support the slogans of that one of the two [!!] forces which is interested in breaking down the present regime” (the democratic intelligentsia was declared to be “a force”); hardly had the first letter been circulated and the second letter reached Russia, hardly had the class-conscious workers had time to read these marvellous missives and to have a good laugh at them, when the events of the real struggle of the proletariat promptly swept all this political rubbish of the new-Iskra publicists on to the waste heap. The proletariat showed that there is a third force (actually, of course, not third, but, in sequence, second and in fighting ability first), which is not merely interested in breaking down the autocratic regime, but is ready to start on the actual job of breaking it down. Since the Ninth of January, the working-class movement has been developing before our very eyes into the popular uprising. Let us see how this transition to the uprising was evaluated by the Social-Democrats, who had discussed it in advance as a question of tactics, and how the workers themselves began to settle this question in practice. Three years ago the following was said on insurrection as a slogan that defines our immediate, practical tasks: “Picture to yourselves a popular uprising. Probably every one will now agree that we must think of this uprising and prepare for it. But how? Surely the Central Committee can not appoint agents to all localities for the purpose of preparing the uprising! Even if we had a Central Committee, it could achieve absolutely nothing by such appointments under present-day Russian conditions. But a network of agents that would form in the course of establishing and distributing the common newspaper would not have to ’sit about and wait’ for the call to insurrection, but could carry on such regular activity as would guarantee the highest probability of success in the event of an insurrection. Such activity would strengthen our connections with the broadest masses of the workers and with all strata that are discontented with the autocracy, which is of such importance for an uprising. Precisely such activity would serve to cultivate the ability to estimate correctly the general political situation and, consequently, the ability to select the proper moment for the uprising. Precisely such activity would train all local organisations to respond simultaneously to the same political questions, incidents, and events that agitate the whole of Russia and to react to these ’incidents’ in the most vigorous, uniform, and expedient manner possible; for the up rising is in essence the most vigorous, most uniform, and most expedient ’answer’ of the entire people to the government. And lastly, it is precisely such activity that would train all revolutionary organisations throughout Russia to maintain the most continuous, and at the same time the most secret, contacts with one another, thus creating real Party unity; for without such contacts it will be impossible collectively to discuss the plan for the uprising and to take the necessary preparatory measures on the eve, measures that must be kept in the strictest secrecy. Perhaps, having read this tirade, the reader will say that obviously Martynov is “anything but” a serious opponent and that it would be absurd to take him seriously. We would quite agree with the reader. We would even say to such a reader that no greater evil on earth could befall us than to have to take all the theories and all the arguments of our new Iskrapeople seriously. The only trouble is that this nonsense appears also in the editorials of Iskra (No. 62). Worse still, there are people in the Party, by no means few, who stuff their heads with this nonsense. And so we have to discuss non-serious matters, just as we have to discuss the “theory” of Rosa Luxemburg, who discovered the “organisation-as process”. We are obliged to explain to Martynov that up rising must not be confused with people’s revolution. We have to keep explaining that profound allusions to a revolution in social relations when what is at issue is the practical question of the ways of overthrowing Russian autocracy are worthy only of a Kifa Mokiyevich. This revolution began in Russia with the abolition of serfdom, and it is the backwardness of our political superstructure as compared with the accomplished revolution in social relations that makes the collapse of the superstructure inevitable; an immediate collapse as the result of a single blow is quite possible, since “the people’s revolution” in Russia has already dealt tsarism a hundred blows, and whether the hundred and first or the hundred and tenth will finish it off is really a matter of conjecture. Only opportunist intellectuals, who try to impute their own philistine ways to the proletarians, can flaunt their high school knowledge of a “revolution in social relations” at a time when practical ways are being discussed for delivering one of the blows in the second hundred. Only the opportunists of the new Iskra can raise hysterical clamours about a sinister “Jacobin” plan, the keynote of which, as we have seen, is all-round mass agitation by means of a political newspaper. A people’s revolution, true, cannot be timed. We cannot but praise Martynov and the writer of the leader in Iskra, No. 62, for knowing this truth (“what thought of preparing the uprising can there possibly be in our Party?” asked Martynov’s loyal associate, or disciple, in that article, warring on the “utopians”). But if we have really prepared an uprising, and if a popular uprising is realisable by virtue of the revolutions in social relations that have already taken place, then it is quite possible to time the uprising. We shall attempt to clarify the point for the new-Iskra followers by a simple example. Can the working-class movement be timed? No, it cannot; for that movement is made up of thousands of separate acts arising from a revolution in social relations. Can a strike be timed? It can, despite the fact—just imagine, Comrade Martynov—despite the fact that every strike is the result of a revolution in social relations. When can a strike be timed? When the organisation or group calling it has influence among the masses of the workers involved and is able correctly to gauge the moment when discontent and resentment among them are mounting. Do you see the point now, Comrade Martynov and Comrade “leader-ist” of Iskra, No. 62? If you do, then please take the trouble to compare an uprising with a people’s revolution. “A people’s revolution cannot be timed in advance.” An uprising can be, if those preparing it have influence among the masses and can correctly estimate the situation. Fortunately, the initiative of the advanced workers happens to be far ahead of the tail-ist philosophy of the new Iskra.While the latter is squeezing itself dry for theories to prove that an uprising cannot be timed by those who have prepared for it and have organised the vanguard of the revolutionary class, events show that those who have not prepared may time, indeed, are sometimes compelled to timer an uprising. Here is a leaflet sent to us by a St. Petersburg comrade. It was set up, printed, and distributed in more than 10,000 copies by the workers themselves, who had seized a legal printing-press in St. Petersburg on January 10. “Workers of All Countries, Unite! “Citizens! Yesterday you witnessed the brutality of the autocratic government. You saw blood flowing in the streets. You saw hundreds of fighters for the working-class cause lying dead; you saw death, you heard the groans of wounded women and defenceless children. The blood and brains of workers bespattered the roadways that workers’ hands had laid. Who directed the troops, the rifles, and the bullets against the workers’ breasts? “The tsar, the grand dukes, the Ministers, the generals, and the scoundrels at Court. “They are the murderers! Death to them! To arms, comrades, seize the arsenals, the munitions depots, and armourers’ shops. Break down the prison walls, comrades, and release the fighters for freedom. Smash up the gendarme and police stations and all government institutions. Let us overthrow the tsarist government and establish our own. Long live the revolution! Long live the Constituent Assembly of People’s Representatives! The call to insurrection issued by this handful of advanced enterprising workers did not meet with success. Several unsuccessful calls to insurrection, or several unsuccessful “timings” of insurrection would not surprise or discourage us. We leave it to the new Iskra to hold forth in this connection on the necessity of a “revolution in social relations” and grandiloquently to condemn the “utopianism” of the workers who exclaimed, “Let us establish our own government!” Only hopeless pedants or muddle-heads would regard this watchword as the central point of such an appeal. What is important for us to note and emphasise is the remark ably bold and practical manner in which the problem now squarely confronting us was posed. The call of the St. Petersburg workers was not answered and could not have been answered’ as quickly as they wished. This call will be repeated time and again, and the attempts at an uprising may result in more failures. But the very fact that the workers themselves have raised this issue is of tremendous significance. The gain which the working-class movement has made in bringing home the practical urgency of this problem and in moving it closer to the forefront of any popular unrest is a gain that nothing can take away from the proletariat. As much as three years ago the Social-Democrats had on general grounds advanced the slogan of preparing the uprising. The independent activity of the proletariat arrived at the same slogan as a result of the direct lessons taught by the civil war. There are two kinds of independent activity. There is the independent activity of a proletariat possessed of revolutionary initiative, and there is the independent activity of a proletariat that is undeveloped and is held in Leading-strings; there is a consciously Social-Democratic independent activity, and there is a Zubatovist independent activity. And there are Social-Democrats who to this day contemplate with reverence the second kind of independent activity, who believe that they can evade a direct reply to the pressing questions of the day by repeating the word “class” over and over again. We need but take No. 84 of Iskra. “Why,” asks its “leader-ist”, bearing down on us with a triumphant air, “why was it not the narrow organisation of professional revolutionaries, but the Workers’ Assembly that set this avalanche in motion [January 9]? Because this Assembly was a really [mark this!] broad organisation. based on the independent activity of the working-class masses.” If the author of this classical phrase were not an admirer of Martynov, he might have understood that the Assembly rendered a service to the movement of the revolutionary proletariat only when and to the extent that it passed from Zubatovist independent activity to Social-Democratic in dependent activity (after which it immediately ceased to exist as a legally functioning organisation). Had the new-Iskrists, or the new-Rabocheye Dyelo-ists not been tail-enders, they would have realised that it was the Ninth of January that justified those who had said that “...in the long run the legalisation of the working-class movement will be to our advantage, and not to that of the Zubatovs” (What Is To Be Done? ). It was the Ninth of January that proved again and again the importance of the task formulated in that pamphlet: “...we must prepare reapers, both to cut down the tares of today [paralyse today’s corrupting influence of the Zubatov movement] and to reap the wheat of tomorrow” (give a revolutionary lead to the movement that has advanced a step with the aid of legalisation). The Simple Simons of the new Iskra, however, use the bountiful wheat harvest as a pretext for minimising the importance of a strong organisation of revolutionary reapers. It would be criminal, the new-Iskra leader-writer continues, “to attack the revolution in the rear”. What this sentence means, God only knows. As to its bearing on the general opportunist complexion of Iskra, we shall probably deal with the point on another occasion. Here it will suffice to indicate that this sentence can have but one true political meaning, namely, that the author grovels in the dust before the rear of the revolution and disdainfully turns up his nose at the “narrow” and “Jacobin” van of the revolution. The more the new Iskra displays its Martynovist zeal, the clearer becomes the contrast between the tactics of tailism and the tactics of revolutionary Social-Democracy. We pointed out in the first issue of Vperyod that an up rising must connect itself with one of the spontaneous movements. Consequently, we do not in the least forget the importance of “guarding the rear”, to employ a military term. In Vperyod, No. 4, we referred to the correct tactics of the St. Petersburg Committee members, who from the outset directed all their efforts towards supporting and developing the revolutionary elements in the spontaneous movement, while at the same time maintaining an attitude of reserve and distrust towards the shady, Zubatov rear of that movement. We shall conclude now with a piece of advice, which no doubt we shall have to repeat more than once to the new-Iskrists: Do not minimise the tasks of the revolution’s vanguard, do not forget our obligation to support this van guard by our organised independent activity. Use fewer platitudes about the development of the independent activity of the workers—the workers display no end of independent revolutionary activity which you do not notice!—but see to it rather that you do not demoralise undeveloped workers by your own tail-ism. ***Kifa Mokiyevich—a character in Gogol’s Dead Souls depicted as a type of person who is absorbed in the solution of idle and sense less problems.